Bear season begins soon at a trash can or dumpster near you. To make this a safe spring and summer for bears and humans, the New Mexico Department of Game and Fish is encouraging the public to manage their trash properly. Every year, bears that come into towns searching for food are caught and relocated or killed by department employees. Bears are killed when conservation officers determine the bears are a threat to public safety. Bears that regularly feed on garbage can lose their fear of humans and consider humans as a source of food. This year, the department will increase its efforts to eliminate trash-habituated bears. Populations of bears and humans have grown significantly in New Mexico. In 1925, just prior to bears being protected as game animals, a conservative estimate of the bears on U.S. Forest Service land was 660 animals. Today, the statewide estimate exceeds 6,000 bears. To illustrate the problem trash creates for bears and bear managers, the Department of Game and Fish produced a short documentary about bears and trash in the City of Raton. The department is working with Raton and San Miguel County to address their trash management issues. The agency is trying to obtain grant money to purchase new bear-resistant dumpsters. Raton has 3,200 residential dumpsters and 800 business dumpsters for a population of 7,000 residents. 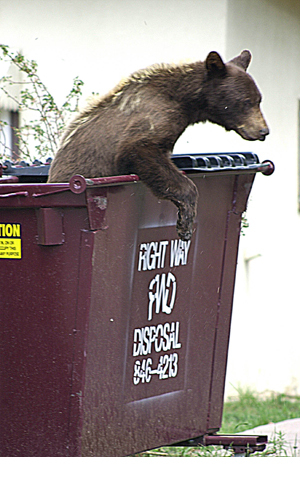 “The City of Raton has agreed to enter into an agreement with Game and Fish to get rid of all the dumpsters in town and replace them with larger, bear-proof, containers, which should reduce human/bear conflicts in the community,” said Officer Clint Henson. A screening of the department’s video, “The Modern Black Bear: Born Wild, Raised on Trash” and a news conference is scheduled at 1 p.m. May 3 at the Rio Grande Nature Center State Park’s Education Center in Albuquerque. Other screenings will be shown around the state, and dates and times will be available soon on the department’s website, www.wildlife.state.nm.us. Pick fruit as it ripens and do not allow it to rot on the ground. Do not feed seed to birds in mountain communities between April 15 and Nov. 1. Remove hummingbird feeders if bears are using them. If water is attracting bears, do not provide it. That includes decorative fountains and bird baths. Clean barbeque grills thoroughly and place them in a secure building. Do not stack wood against your home as bears are attracted to rodents. Pick up trash immediately if it is scattered by bears or other animals. “We recognize that it’s a thrill to see the bears in town or being released back into the wild on the TV news, but fed bears are dead bears,” Winslow said.